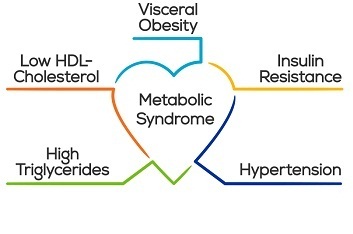 Metabolic syndrome is the epidemic that has clutched today’s world. Obesity along with various ailing conditions along with it- Diabetes, High Blood Pressure, high triglycerides, Insulin resistance and dysmetabolic syndrome. The number of people with metabolic syndrome increases with age, affecting more than 30 to 40 % of people in their age, between 50’s to 70’s. Wrong lifestyle choices- eating junk and non-nutritive food, not exercising, excessive drinking, smoking, sleeping, and stressful environment are few main factors for metabolic syndrome. In some cases it is genetic also.